For years, the government has put out hits on people that they found “expendable,” or who they felt were “talking too much,” covering up their assassinations with drug overdoses and mysterious suicides. 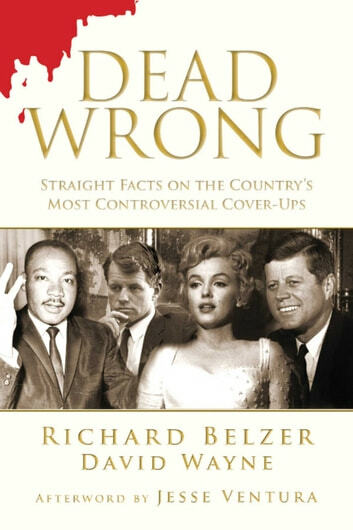 In Dead Wrong, a study of the scientific and forensic facts of various Government cover-ups, Richard Belzer and David Wayne argue that Marilyn Monroe was murdered, that the person who shot Martin Luther King Jr. was ordered to do so by the government, and examines many other terrifying lies we've been told throughout our country’s history. The extensive research shows how our government has taken matters into its own hands, plotting murder whenever it saw fit. Belzer and Wayne also examine the deaths of White House Counsel Vincent Foster, U.N. Weapons Inspector Dr. David C. Kelly, and bio-weapons expert Dr. Frank Olson, as well as the cases of two murders directly linked Lyndon B. Johnson, the 36th President of the United States. “Big Brother” is watching you—through the scope of a sniper rifle. Dead Wrong will give you the straight facts on some of the most controversial and famous deaths this country has ever seen. The harsh reality is that our government only tells us what we want to hear, as they look out for their own best interests and eliminate anyone who gets in their way.